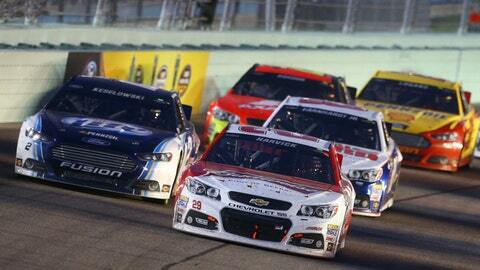 Sprint Cup cars racing unrestricted at Daytona International Speedway? NASCAR’s top tour using engines for more than one race? That day might be closer than you think. As part of an initiative to improve racing and decrease ever-rising costs, NASCAR is discussing how to lower the horsepower in the Cup series and extend the life cycle to two races per engine – initiatives that could be implemented as early as 2015. From a performance standpoint, there’s a general consensus that slowing down the cars would have the greatest impact on the racing itself. Slowing the cars would bunch up the packs and possibly make the racing tighter and closer. IMSA is currently using a sonic restrictor – which is a solution engine builders have proposed to NASCAR. To eventually remove the plates completely, a concept that was introduced in 1988, horsepower will have to be cut considerably. "We’ve been looking at making the durability of the engine and thinking 1,500 miles – even that, we’re asking the guys if that’s the right number," Stefanynshyn said. "We’re thinking our longest race is 600 miles. You do two 600s, that’s about 1,200 and you then have qualifying, so 1,500 sounds about right. We’ll come back and see if that’s the right number, then you can determine whether you can run them for two races. Stefanyshyn’s group at the Research and Development Center is holding ongoing meetings not only with the engine builders, but also aerodynamic and electrical specialists, too. On the engine side, the most recent meeting on January 21 included representatives from all three manufacturers along with NASCAR’s Stefanyshyn, Bill Erskine, director of powertrain electrical and telematics, and Kenny Lawson, supervisor of engine inspections. Stefanyshyn’s group polled NASCAR’s engine braintrust to ascertain which areas to tackle first. Other suggestions include moving from a flat tappet camshaft in the Cup engines to the roller camshafts which are currently used in the Nationwide and Truck series. Consequently, Cup engines could be recycled to the lower series. "As engine builders we’ve tried to cross this bridge many times," said Doug Yates, CEO of RoushYates, which supplies engines to NASCAR’s Ford teams. "Should we go roller cams all the way across every series? And there was always a good reason not to do it. Well, today there is probably a better reason to do it than not to do it because if we’re going to run engines longer and get more life out of them and save some costs it would be better to have a roller cam application rather than a flat tappet application. Yates is grateful NASCAR evolved from multi-engine weekends in the Cup series to single-engine shows and the commitment it has made to cost containment. As a shareholder in the sport, he also appreciates the exchange with the sanctioning body. But for someone who has grown up in the sport, Yates feels it’s important not to rush into any decisions that could "compromise" speed too much or racing in the future. Richie Gilmore, Yates’ counterpart on the Chevy engine side, agrees that the line of communication with NASCAR has been "healthy. " Still, as COO of Earnhardt Childress Racing engines, Gilmore realizes that competition comes with a price. Stefanyshyn understands the challenges facing the teams. Since taking his post in June, he’s done his best to consider the needs of the competitors along with fans’ desire to be entertained. "Basically we’re talking to the industry about how can we improve the racing product and how can we do it in a way that’s fiscally responsible and makes the business more viable," Stefanyshyn said. "So what we’re trying to do is make the business more viable while increasing the entertainment value for the fan.